So, this is a new wallpaper from me, featuring Okami, a very, very cool game for PS2 console. Anyone played it? I just happen to know a bit about this game from my friend... (I don't have PS2 T_T) and I think it's a very revolutionary game. A totally new kind of genre, combining magic, and battles using some kind of kanji-writing. And it has beautifully hand-drawn artwork as you can see here. As for the bg, I tried (and failed miserably IMO) to make a hand-drawn look using some vector shapes and PS effects. Combining brushing, vectoring and my usual F/X to make a different, bizzare traditional-abstract scene. Lots of space for icons on the left ^_^ Yay!. I hope you enjoy it, minna! Especially for Okami lovers, and my long-time-no-see friends *gives a jumbo hug for everybody*. Oh, and don't worry... I'm not overworking myself, just saving some extras for year-end holiday. I hope I can be more active again here next year! Ja, mata kondo ne~! i like of these shades in the bg! Well I never played the game, but knew about it since quite a while because it has indeed beautiful art ^^. Anyway glad you're back and doing those kind of walls. Technically I coulnd't find any critic about this, looks clean and well executed. On the other hand it doesn't work as a wall for me at all, somehow it just doesnt come together all that well. All personal opinion of course. I really like some of those shapes and you're good as always with those orange tones, just the style doesnt blend for me. I love wolves, in general. So I really love the design and the feral look of the creature and the bg matches his sort of solitary feel and the overall design. The symbols and the design of the bg is awe-inspiring without going overboard. Really nice work. so cool! the background rocks. ahhh! yer back comrade.. welcome ... the wall is cool .. but i've seen better from you .. sharpen in it my GURU ..
WB Korgie! Loving the BG and colors, am not sure it fits the scan that nicely though, it kinda struck me as two different elements altogether.. the scan is more 'rough' I guess.. maybe it's just me hahahaha XD See ya around! Hmm, I guess you caught the God of the dog in the painting, it is dashing in terms of full view and colors wise, I think it is fantastic, what really is wonderful is how detailed the background is, in certain sense, it overshadows the great Okami, rendering another way of appreciating the wall itself. A great idea, with lovely character, good work, but could have been better in terms of focus. Great Gold Sunset effect , and really neat chinese brush technique, looks great and warm when i use your wallpaper in my destop bg ^_~Anyway nice! And then I wanna say, "I luff wolfies! I luff, luff, luff that luffly wolfy on the right! Aww... *pats pats wolfy and takes it home* I love it. ^___^"
"I luff the background too, and I liked it how you left space in the left corner for icons. OMG, that's so considerate/smart/luffly of you! ^.^ Most uber wallies have something on the left, so it's no pretty thing to see my desktop icons over it. And I don't like moving my icons around. They like where they are now..."
"Anyway, pretty, pretty wallie. I'm going to take it hom.. Thanks! <333"
*evil laughs* "I leave a present for you though ------> + fav!" What is this? There's an Okami section now? :D Awesome! I don't really like the weird circle thingies on the left, but the rest of it is nice. Puppy's are cute <3 love the art! Wow. Such a beautiful wall. I've always wanted to try and play this game..this wall makes me want to go out and buy it right now. Thanks for sharing! 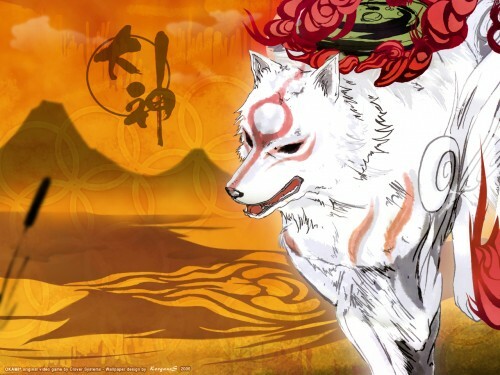 Definitely one of the better oKami pics I've seen.